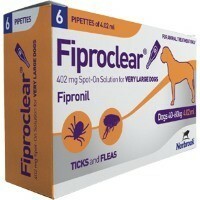 Fiproclear Spot-On Solution for Very Large Dogs is for the treatment and prevention of flea infestations and ticks in very large breed dogs weighing 40-60kg. Each spot-on treatment has insecticidal efficacy against new infestations by adult fleas for up to 8 weeks and has a persistent acaricidal efficacy against ticks for up to 4 weeks. Fiproclear can also be used as part of a treatment strategy for the control of Flea Allergy Dermatitis (FAD) in cats, where this has been previously diagnosed by a veterinary surgeon. Apply 1 pipette of 4.02ml to the base of your dog’s neck ensuring it is directly in contact with the skin and in an area your dog can’t lick off. For dogs weighing over 60kg use 2 pipettes of 2.68ml.